Paul van Dyk will drop the curtain on his fourth day-through-night We Are One music festival in Berlin this coming 4 July. 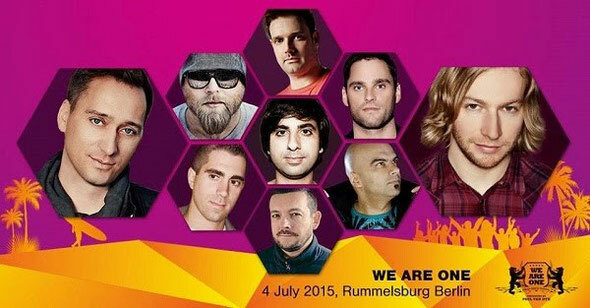 From the broad range of electronic music, PvD recently revealed the full line-up of DJs, who’ll each bring their own sound to 2015’s We Are One. The festival is moving to an increased capacity location, with a fresh concept that incorporates an extended Paul van Dyk set length. It also expands from one to two festival stages. Flying in to drop their tech/techno/house fusions onto W.A.O.’s beaches will be James Zabiela, Lost & Found Records’ honcho Guy J and Watergate/Snowbombing regular Marc Roberts. Alex M.O.R.P.H. and Giuseppe Ottaviani all aim to ensure that all arms remain firmly locked in the upright position, as will Paul Thomas and (returning for his second W.A.O. in a row) Chris Bekker with their debut B2B set. You’ll also be able to zero in on the sounds of Paul’s ‘Louder’ collaborator Roger Shah, who completes the W.A.O. 2015 bill. Over the course of the festival, PvD will be performing over a 12-hour duration between the beach and it’s top-secret nighttime waterfront location. With Tiki bars, BBQ joints and sand and water as far as the eye can see, Rummelsburg Beach provides this year’s setting. Excellent post. I was checking constantly this blog and I am impressed! Very useful info particularly the last part :) I care for such information a lot. I was seeking this particular info for a long time. Thank you and good luck.